This one almost slipped my radar but thanks to Stephanie of Cupcakes & Sundry, I managed to home in on it. 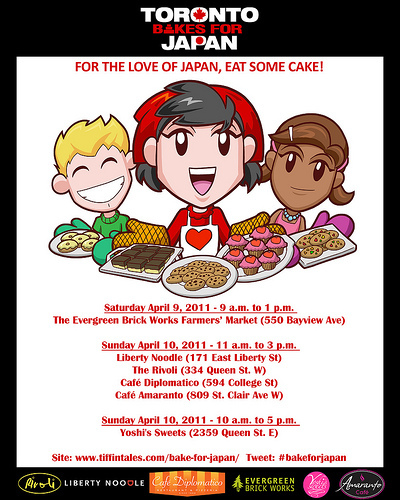 For those people who live in the greater Toronto area, this Sunday April 10th there were be multiple bake sales to help raise funds for the Japan earthquake victims. Some of the best bakers in the TO area will be selling off delicious goodies for only a fraction of the cost. There is also live music and pieces of artwork will be auctioned off. Come out and show your support for those in need. Stephanie of the Cupcakes and Sundry food blog will be selling her wares at the Liberty Noodle from 11am to 3 pm. On Saturday, April 16th, the Langford Fire Hall #1 in Langford, British Columbia will be hosting a Book & Baked Goods Sale from 9am to 2pm. All proceeds go to support a family with one final wish. Donations of monetary value or book sale items may be made by contacting Rebecca at 250-920-8433. Please only donate what would be sellable. Special thanks for this fundraiser go to the Langford Fire & Rescue and the Langford Women’s Auxiliary. This entry was posted in Your Island Guide and tagged Auction, Fundraiser. Bookmark the permalink.